This was dinner yesterday! And BOY was it GOOOOOD! 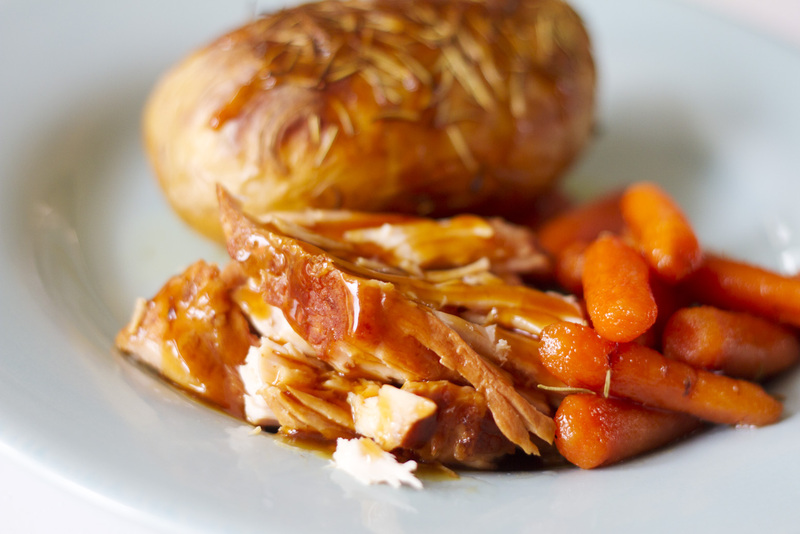 All you have to do is start with a crock pot, good quality pork roast, a few simple ingredients and BAM! Amazing meal! I hope you try it and love it, just like we did! First, pour your apple juice, teriyaki sauce and beef stock into your crock pot. Second, rub the seasoned salt on all sides of the roast. Then in a heavy duty saute pan, brown all sides of the roast to lock in flavor and juices. Next, put your browned roast in the crock pot. The liquid in the crock pot should cover 3/4 of the height of the roast. Add the chopped white onion and peeled garlic cloves. Turn crock pot on low for 7 hrs. Every so often while it's cooking, take the lid off and spoon the cooking juices over the top of the roast. Once the roast is finished slow cooking, take it out and let it rest while you make the glaze. Strain the drippings/cooking broth through a sieve into a medium sized sauce pan. Put the pan over medium heat. Take one tablespoon of cornstarch and mix it with a small amount of the cooking broth. Add back to the pan and cook until the broth starts to boil and thicken. Should only take about 2-3 minutes. Oh Kara, you're making my mouth water. This is definitely dinner tomorrow - yum!